Match made in heaven. A common expression that couldn’t reflect Miriam and Michael more perfectly. Both architects, Miriam and Michael, used their creativity to build an extraordinary wedding at the Baltimore Museum of Industry. They used LEGO’s to design one of a kind centerpieces, “Mr. and Mrs” signs, and other decorations. Instead of a standard wedding guestbook, they had puzzle pieces available for their guests to sign. When the puzzle pieces were constructed it reflected a photo of the Baltimore Museum of Industry. 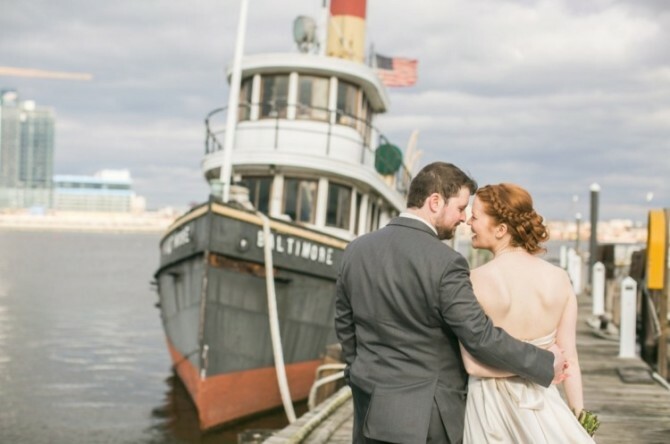 What a great way to remember their Baltimore Museum of Industry Wedding and all of their family and friends that were there to celebrate with them. We designed a stations style menu to compliment this fun and unique wedding. The Stationary appetizers featured Lemon Butter Calamari; Antipasto of marinated olives, artichoke hearts, Provolone cheese drizzled with balsamic glaze, Genoa Salami, pepperoncini, mushrooms, roasted red peppers; Middle Eastern Trio of Hummus, Babaganouch and Olive Tapenade with pita; and Crudite Shots of carrots, asparagus, red peer with ranch dipping sauce. Our staff also passed appetizers including Miniature Pork Belly Tacos, Sirloin Wrapped Asparagus, Bang Bang Shrimp, Tomato Soup Shooters with Crust-less Smoked Gouda Cheese Wedges, and Minted Lamb Meatballs served with Tzatziki sauce. -Argentine Bogota Nights Station: Featuring Carved Sirloin Strip Steak with caramelized onions and Chimmique Sauce (Chimichurri and Barbecue sauce). Argentinian Roasted Chicken with fresh herbs and a hint of rosemary. Warm potato salad with red onions, sour cream and fresh parsley. Quinoa Salad with with avocado, diced tomato, corn, black beans, and cilantro. -Fruits of the Sea Station: Featuring Red Thai Curry. Ahi Tuna Martini with Asian Slaw, avocado, and wasabi sauce. Cocktail crab claw display served with herb mustard dipping sauce and spicy cocktail sauce. -Roman Grill Pasta Station: Featuring Penne Pasta or Tricolor Cheese Tortellini prepared to order. Toppings including grilled chicken, toasted pine nuts, diced tomatoes, scallions, sliced black olives, pepperoncini, mushrooms, red and green peppers, red onion, capers, artichoke hearts, crumbled Gorgonzola cheese, grated Parmesan cheese. Seasonings including, fresh oregano, basil, garlic, chopped chives, and parsley. Sauces including pesto, Sundried tomato marinara, olive oil, and Alfredo. Served with Caesar Salad. For dessert we served Baltimore’s renown, Dangerously Delicious‘ pies. This delicious bakery provided an assortment of pies including Cherry, Caramel Apple Crumb, and the bakery’s signature Baltimore Bombs (loaded with Berger Cookies (a local specialty) that melt down and swirl into a sweet, vanilla chess filling). To say these pies were the cherry on top would be an understatement! All photos in this blog post belong to Living Radiant Photography. Check out these wonderful photographs to catch a glimpse into this widely creative Baltimore Museum of Industry wedding. Congratulations to Miriam and Michael! Catering your winter wedding was such a treat! Error: Error validating access token: Session has expired on Friday, 12-Apr-19 20:42:14 PDT. The current time is Thursday, 18-Apr-19 06:21:31 PDT.